Jeannette Parent and her twin sister Annette were born in Baker, Montana, in 1922 to French-Canadian parents from Quebec and spoke mostly French at home until they started school. Both joined the religious community, but Sister Annette had a head start because Jeannette actually entered twice. In July 1942 the twins entered together, but four months later, plagued by eye problems, Jeannette left without even saying goodbye. The two were reunited when Jeannette re-entered the religious community. Jeannette attended a small country school near Baker until the family moved to Springdale, Washington, in 1935 and then enrolled at the much larger public school, Mary Walker School. Her junior year was at Marycliff High School in Spokane and her senior year was at St. Joseph Academy in Sprague, Washington. Jeannette made first vows as a Sister of Providence at Mount St. Vincent, Seattle, taking Sister Blasius as her name in religion. Assigned to Sacred Heart Province after profession, she was disappointed when her first place of ministry was in the sisters’ infirmary right at St. Vincent Home for the Aged, in Seattle. She graduated from LPN training school in Olympia, Washington, and then took one quarter of clinical pastoral education (CPE) preparation at Sacred Heart Medical Center in Spokane. She was a patient visitor at St. Vincent Hospital in Portland, Oregon; and then at Providence Hospital, Seattle. After nurse’s training she served as an LPN at Mount St. Vincent, Seattle, at St. Mary Hospital in Astoria, Oregon; and then at Providence Hospital, Everett, Washington. 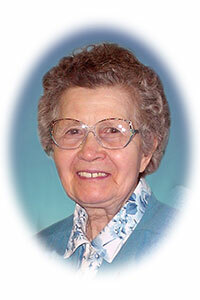 Reassigned to the former St. Ignatius Province in 1972 so she could help care for her parents, she served at St. Clare Hospital, Fort Benton, Montana; and then at Mount St. Joseph sisters’ infirmary and St. Joseph Care Center, both in Spokane. Sister Jeannette retired in 1995 but continued to be an active volunteer at St. Joseph Care Center, St. Brendan Continuing Care Center, and elsewhere. “All my ministries were important to me,” she said. Among her favorites were two volunteer ministries, time spent caring for the babies at a Spanish day-care Center in Walla Walla, Washington, and at St. Thomas Child Care in Great Falls, Montana. Sister Annette Parent, her twin and close companion of many years, died in 2009. Today, Sister Jeannette has a ministry of prayer and presence at St. Joseph Residence, Seattle. She has seen a lot of changes in her 60 years in the religious community, but she is grateful to God for all that has been and all that will be. Sister Jeannette retired in 1995 but continued to be an active volunteer at St. Joseph Care Center, St. Brendan Continuing Care Center, and elsewhere.